I’ve always done my scrapbooks for my enjoyment, and never given it another thought. Then this month a friend of mine entered a challenge on the About A Boy Challenge Blog. She shared her creation on her blog C’est La-Vie Designs Unltd., LLC. I’d never heard of a challenge blog, but it was it a fun thing to look through everyone ideas. 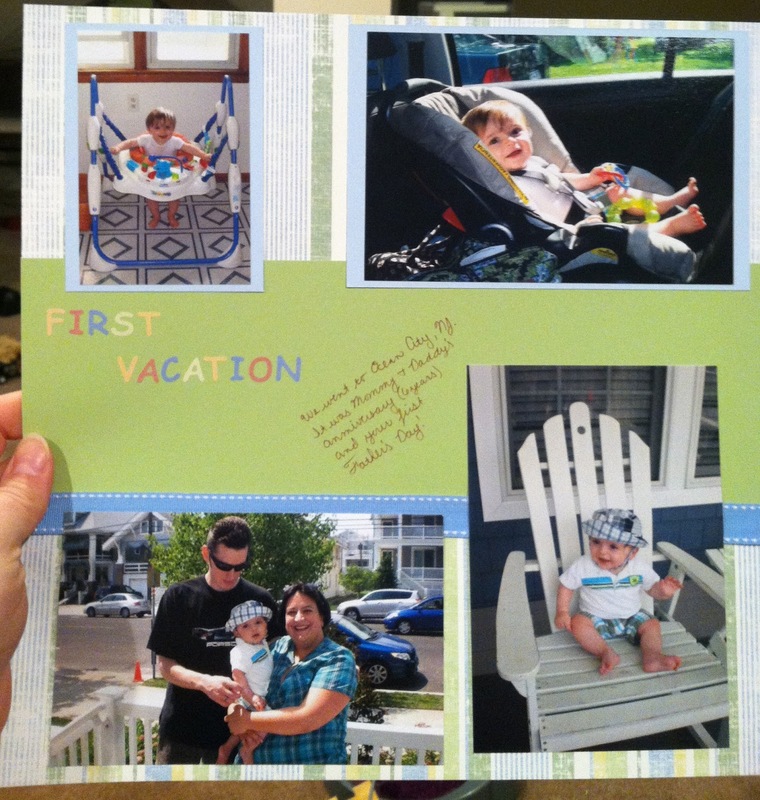 I decided that since all of scrapbooking revolves around our son Michael it shouldn’t be hard to have something to enter. I took the pictures from the first day of his first vacation. The top two are him waiting to go, and the bottom two are when we arrived. We left two days before his 7m birthday. It was also Dylan (I have always called him just D) and I’s sixth anniversary, and D’s first Father’s Day. We went with my parents and my younger sister (she was 17 at the time and I was 30!). It was such a special trip. I would say my scrapbooking style is very simple, but I’ve been trying to use some new techniques and branch out. The ribbon on the page was something new for me. I never seem to have luck getting it straight. Thanks for looking, and I hope to have lots more to share with you soon. Great layout! You've showcased some very sweet pictures from your vacation. You guys had a lot to celebrate too. Thanks for playing with us at About A Boy. Wonderful! Thank yo for playing along at About a Boy! Oh my goodness! Thanks so much! So glad you entered too! Thanks sooooooo much for linking back to my blog. I'll share yours on mine as well. I'm all smiles!